By composting waste materials on-site, businesses can significantly reduce the amount of waste that needs to be disposed of and thereby save money from avoided disposal costs. It may be difficult in order to figure out which type of composting process to go with. Here are some options. Aerobic composting uses oxygen and bacteria and replicates natural decomposition. The process of aerobic composting can be used with all types of organic waste and is also suitable for waste that is high in nitrogen. Plant matter such as grass clippings and leaves encourage a type of bacteria to grow that produces high temperatures, up to 160 degrees Fahrenheit. Aerobic composting works quickly but requires a high amount of maintenance, as the moisture and temperature need to be monitored closely. Additionally, aerobic composting needs to be turned every few days to allow for proper air circulation. This composting process is best used outside and can be used with a large amount of materials. Aerated static pile composting allows for all types of organic waste to be mixed together into one large pile. Air enters the mixture through a series of pipes and loosely piled bulking agents. This method is not efficient enough to compose animal byproducts or greases. Aerated static piles require less maintenance than Windrow composting. However, in colder climates, aerating the piles may be more troublesome. The overall temperature still must be closely monitored. With appropriate ventilation, aerated static compost piles can be used both indoors and outdoors. 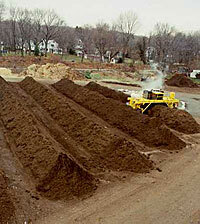 Aerated static piles typically produce compost within 3-6 months. In-vessel Composting uses a process where organic waste is fed into a drum, silo, or concrete-lined trench, where the temperature, moisture, and aeration are closely controlled. In-vessel composting typically has a mechanism to turn or agitate the material for proper aeration. In-vessel composters are efficient and compact in comparison other methods of composting. In-vessel composters can intake any type of organic waste and some, like the LFC, can fit in schools or restaurant kitchens. In-vessel composting can be used indoors and outdoors and is incredibly low maintenance due to its automation. Odor, leachate, and rodents aren’t an issue. In-vessel composters can convert organic material to compost in as little as 24 hours to as long as a few weeks. Traditional bio-digesters use heat oxidation, an aerobic process that requires oxygen. Hi-tech bio-digesting is a relatively new process that has not been around for too long. Bio-digesters usually take 8-12 weeks to finish decomposing. Harmful pathogens are killed by the immense heat that is generated by bio-digesters. 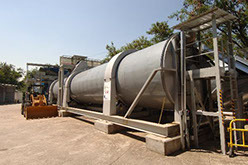 Most bio-digesters use hi-tech machinery that can only be used outdoors. These hi-tech bio-digesters use a one-step method and typically only intakes plant-based food waste. 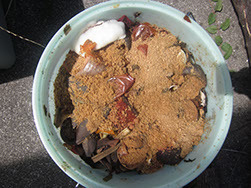 Vermicomposting can be used for composting food waste. 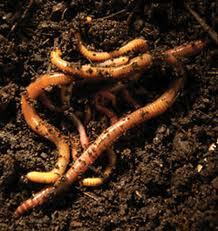 Vermicomposting uses redworms, bacteria, fungi, and other bugs to break down organic matter. Vermicomposting simulates a natural ecosystem where each micro-organism serves a purpose, whether it is to break down materials or produce food for the others. Vermicomposting also takes several weeks to complete and requires proper aeration and moisture conditions. Conditions need monitoring, and need a medium level of maintenance and care. This particular type of composting is best utilized in outdoors areas as the process can leave a smell and attract other creatures and bugs. Windrow composting utilizes long piles of organic waste called “windrows” and is aerated by turning the pile periodically by either manual or mechanical means. 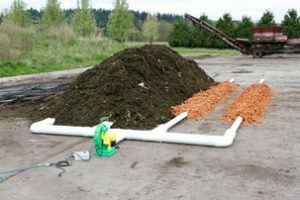 By piling the compost up into “windrows” the process is able to generate sufficient heat and maintain temperatures, but not large enough to cut off all oxygen flow to the center of the compost. Windrow composting requires a high degree of maintenance but it can be utilized for mass composting. 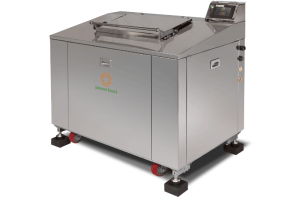 It can be used for high volume food-processing, local governments and communities. Windrow composting is best utilized outdoors and in a variety of climate conditions. Leachate is released from this process and needs to be collected and treated in order to prevent contamination of groundwater and surface-water. There are heavy odors and animal issues associated with this type of composting. Anaerobic composting decomposes waste without oxygen. Anaerobic composting takes several years and typically happens in landfills. In Anaerobic composting, organic materials are piled up and break down naturally. This process does not need any type of maintenance and will not need to be turned. Anaerobic composting produces a large amount of methane and can be exceptionally pungent. Bokashi composting is an anaerobiotic (no air) decaying process and has been utilized by farmers for centuries. Bokashi uses beneficial microbes, or living microscopic cellular organisms, while traditional composting uses heat and soil microbes to break down plant matter. The Bokashi method allows all types of food scraps to be composted, and not just the plant based food waste. Bokashi composting takes 4-6 weeks to break down matter and uses a fermentation process. The acidity kills harmful pathogens and it can be used inside and outside. It requires a two step process. First the food waste is fermented, and then the soil microbes finish the decomposition.